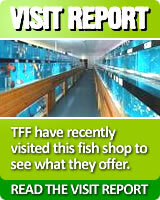 Abacus Aquatics is a tropical fish shop based in the London / Kent area that has been VOTED BEST FISH SHOP IN SOUTH EAST ENGLAND THREE YEARS RUNNING by the readers of Practical FIshkeeping Magazine. Since opening, we have gained a loyal following from customers locally, as well as many who travel from much further afield. The manager has over 30 years experience of keeping and breeding a wide range of fish and is willing to pass on his experience to customers. The shop has over 100 tanks of tropical and coldwater fish and invertebrates and gets regular deliveries of new fish from around the world. We aim to vary our stock to regularly include fish very rarely available elsewhere as well as all the popular community fish. We also get regular deliveries of top quality plants from Holland (which are sold at very competitive prices). A wide range of Juwel and Eheim aquariums are always in stock at competitive prices. We also carry a selection of aquariums from other manufacturers in addition to all equipment and aquarium décoration you are likely to need. This is all backed up by honest and impartial advice. We want to be the kind of shop where beginners can get the right help / advice from and yet still have a number of fish / equipment of interest for even the most experienced fishkeepers. If you would like to receive notifications and special offers from Abacus Aquatics, please add your email address on the right and Abacus Aquatics will email you their newsletter & offers.